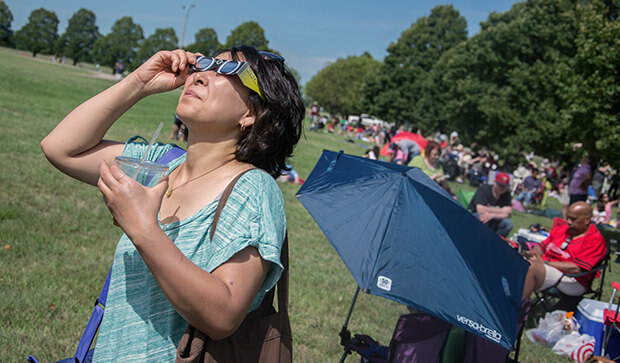 Visitors poured into the Grand Island area on August 21, 2017, to see the great American eclipse. 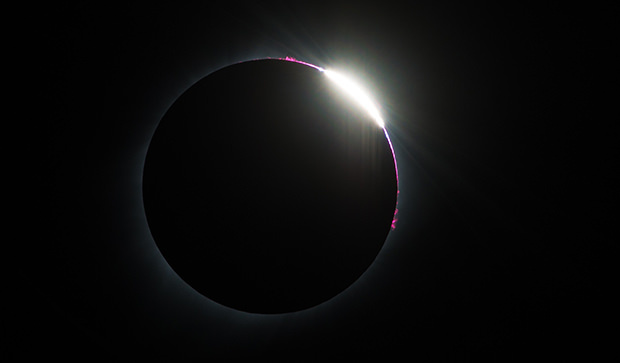 This image of the diamond ring effect was taken at the city's main event at Stuhr Museum. People came to Grand Island from almost every state and from at least a dozen countries around the world. Stuhr Museum really was a tailor-made spot for an eclipse festival. by Dan Glomski, senior educator at Aurora’s Edgerton Explorit Center. On Monday, August 21, 2017, a total solar eclipse crossed the continental United States for the first time in 99 years. Grand Island, located squarely within the path of the Moon’s shadow, was a prime eclipse-viewing location. A total solar eclipse ranks among the most spectacular events a person can witness in a lifetime. The Moon passes directly in front of the Sun, covering the solar disk. Day briefly turns into night – twilight, actually – before the Moon’s motion around Earth begins to unveil the Sun, allowing direct sunlight to bathe the landscape once again. I was in Grand Island during the Total Solar Eclipse. I viewed it at Prairie Museum. It was really fantastic, and I will never forget this experience. Most people have seen nothing like this before. It’s an incredibly dramatic, eerie event that can literally make the hair on the back of your neck stand up. The eclipse path – approximately 70 miles wide – crosses the country from Oregon to South Carolina. This is the first time the Moon’s shadow has traversed the United States coast-to-coast since 1918. Millions of Americans are located either inside the path or within a day’s drive, and with thousands of visitors from outside the United States, this was likely the most-viewed total solar eclipse in history. Grand Island was an enticing location for eclipse viewers. The Moon completely covered the Sun for 2 minutes and 35 seconds, within six seconds of the event’s maximum duration (in southern Illinois and western Kentucky). Grand Island averages 225 sunny days a year according to the National Climatic Data Center. The odds of clear viewing from Grand Island are approximately 70-75%. Many people will believe they've seen a total eclipse before, or that a deep partial eclipse is close enough. However, the most spectacular eclipse phenomena (corona, surrounding twilight, etc) happens only during a total eclipse. The difference between a total eclipse and a partial eclipse is night and day – literally! Thanks to those who visited the city of Grand Island and the state of Nebraska to view the freat American eclipse. We all had a ball! 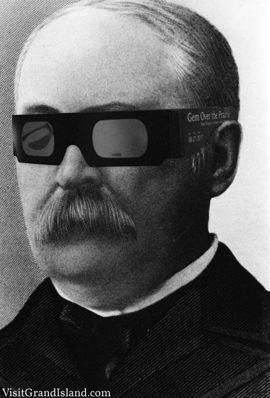 Grand Island eclipse t-shirts can be ordered from T-Shirt Engineers (800-288-7447) and Stuhr Museum (308-385-5316) are both taking orders at this time. Our family was among the thousands who enjoyed the eclipse in Grand Island. I wanted to express our appreciation for the wonderful job that was done in making visitors feel welcome and providing a great experience for all. 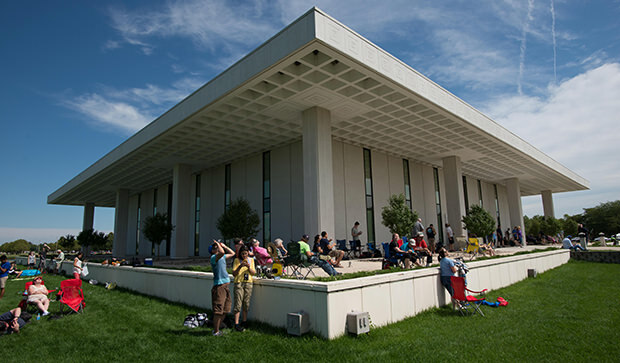 We stayed 3 nights, visited your downtown area and visited the Stuhr Museum the day before the eclipse and then joined the thousands who viewed from the Museum grounds on Monday. The ample parking, shady trees and grass and all the happy people provided for an excellent eclipse experience. We shared the shade from one tree with a couple from Omaha who had lots of extra chairs to share with us, we had extra protective glasses for them and we all shared food and stories as we awaited totality. The atmosphere was wonderful. We have nothing but positive memories of our time in Grand Island! Thank you all so much for sharing your town with all of us.